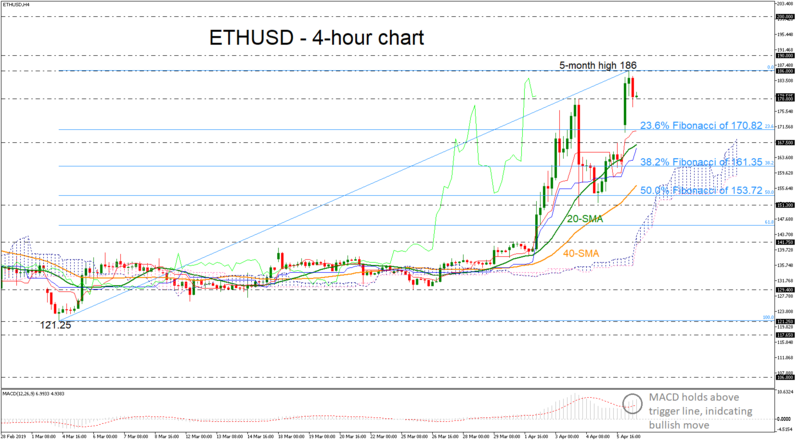 ETHUSD retreated after it found strong resistance on the five-month high of 186 earlier on Monday. Momentum indicators are all supportive of the bullish view, as the red Tenkan-sen line and the blue Kijun-sen line point up, as well as the 20- and 40-simple moving averages (SMAs) in the 4-hour chart. Additionally, the MACD oscillator is strengthening its bullish momentum above trigger line in the positive territory. After the minor bearish retracement, the price may head north again towards the five-month high of 186 before re-challenging the psychological levels of 190 and 200, taken from the bottom on October 31 and from the highs on October 26 of 2018, respectively. On the downside, Ethereum may meet support at the 23.6% Fibonacci level of the upleg from 121.25 to 186, around 170.72. If the market manages to drop below this line, the price could hit the 167.50 hurdle, which stands near the 20-SMA and the upper surface of the Ichimoku cloud. To sum up, the short-term bias turned to strongly bullish, especially after the price overcome the 141.75 barrier to create a bullish rally above the 148.15 at the beginning of this month.